This beautiful King Solomon building stands on the High Street in Paisley. 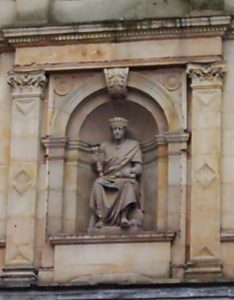 Though empty and presumably devoid of Freemasons for years, a prominent statue of King Solomon stands proud above what would have been the front door, prior to its late 20th century overhaul. Designed by the architect William Daniel McLennan and built in the French Renaissance architectural style, the former Masonic Lodge is now a Category B listed building.